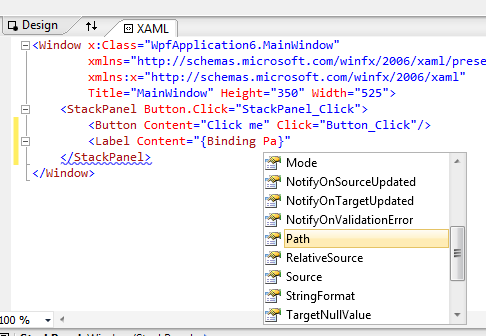 In Visual Studio, Intellisense works in not only the code editor, but also the XAML editor. 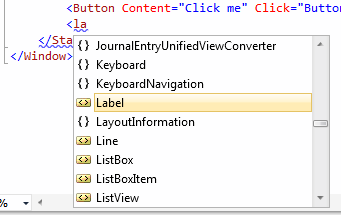 As you being typing an element name, for example, Intellisense will display a window listing possible elements. 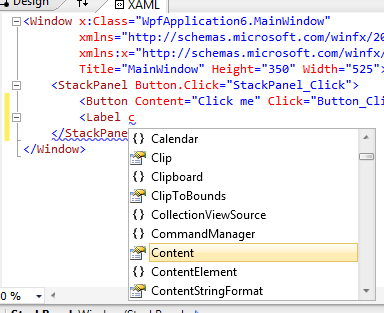 If you press TAB while an element is highlighted, Intellisense will insert the entire element name into the XAML. As you continue typing, Intellisense will display a list of possible attributes that are appropriate for the current element. Again, you can press TAB to insert the complete attribute name. Intellisense will also add an equals (=) sign and a pair of quotation (“) marks. Intellisense is also available when entering binding expressions.